For other uses, see VT 100 (disambiguation). "VT102" and "VT103" redirect here. For the highways, see Vermont Route 102 and Vermont Route 103. The VT100 is a video terminal, introduced in August 1978 by Digital Equipment Corporation (DEC). It was one of the first terminals to support ANSI escape codes for cursor control and other tasks, and added a number of extended codes for special features like controlling the LED lamps on the keyboard. This led to rapid uptake of the ANSI standard, becoming the de facto standard for terminal emulators. The VT100s, especially the VT102, was extremely successful in the market, and made DEC the leading terminal vendor for some time. The VT100 series was replaced by the VT200 series starting in 1983, which proved just as successful. Ultimately, over six million terminals in the VT series would be sold, based largely on the success of the VT100s. DEC's first successful video terminal was the VT50, introduced in 1974 and quickly replaced by the VT52 in 1975. The VT52 featured a text display with 80 columns and 24 rows, bidirectional scrolling, and a custom control language that allowed the cursor to be moved about the screen. These "smart terminals" were a hit both due to their capabilities and their ability to be run over inexpensive serial links, rather than custom connection as in the case of systems like the IBM 3270 that generally required expensive controllers for distribution applications. The VT100 was introduced in August 1978, replacing the VT50/VT52 family. Like the earlier models, it communicated with its host system over serial lines at a speed selectable between 50 and 19,200 bit/s. Basic improvements on the VT52 included a 132 column mode, and a variety of "graphic renditions" including blinking, bolding, reverse video, and underlining. The VT100 also introduced an additional box-drawing character set containing various pseudographics that allowed the drawing of on-screen forms. All setup of the VT100 was accomplished using interactive displays presented on the screen; the setup data was stored in non-volatile memory within the terminal. Maintainability was also significantly improved since a VT100 could be disassembled quickly without use of tools. The major change within the system was the control system. Unlike the VT50/52's proprietary language, the VT100 were based on the emerging ANSI X3.64 standard for command codes. [lower-alpha 1] At the time, computer vendors suggested that the standard was beyond the state of the art and could not be implemented at a reasonable price point. The introduction of low-cost microprocessors and the ever-falling cost of computer memory addressed these problems, and the VT100 used the new Intel 8080 as its internal driver. In addition, the VT100 provided backwards compatibility for VT52 users, with support for the VT52 control sequences. VT131 on display at the Living Computer Museum. The VT100 was the first of Digital's terminals to be based on an industry-standard microprocessor, the Intel 8080. Options could be added to the terminal to support an external printer, additional graphic renditions, and more memory. The later option, known as Advanced Video Option or AVO, allowed the terminal to support a full 24 lines of text in 132 column mode. 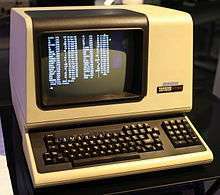 The VT100 became a platform on which Digital constructed related products. The VT101 and VT102 were cost-reduced, non-expandable follow-on versions. The VT101 was essentially a base-model VT100, while the VT102 came standard with the AVO and serial printer port options pre-installed. The VT105 contained a simple graphics subsystem known as waveform graphics which was mostly compatible with same system in the earlier VT55. This system allowed two mathematical functions to be drawn to the screen on top of the normal text display, allowing text and graphics to be mixed to produce charts and similar output. 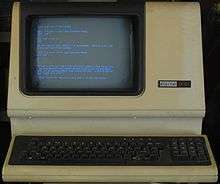 The VT125 added an implementation of the byte-efficient Remote Graphic Instruction Set, ReGIS, which used custom ANSI codes to send the graphics commands to the terminal, rather than requiring the terminal to be set to a separate graphics mode like the VT105. 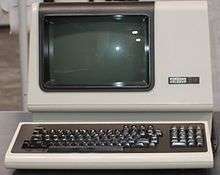 The VT100 form factor left significant room in the case for expansion, and DEC used this to produce several all-in-one stand-alone minicomputer systems. The VT103 included a cardcage and 4×4 (8-slot) Q-Bus backplane, sufficient to configure a small LSI-11 system within the case,:pp65–72 and supported an optional dual TU58 DECtape II block addressable cartridge tape drive :pp73–80 which behaves like a very slow disk drive. The VT180 (codenamed "Robin") added a single-board microcomputer using a Zilog Z80 to run CP/M. The VT278 (DECmate) added a PDP-8 processor, allowing the terminal to run Digital's WPS-8 word processing software. ↑ "VT 510/520 Video Display Terminal", Boundless Technologies. ↑ A similar standard was being organized as ECMA-48, which was fairly similar to X3.64. The two standards were later merged in ISO 6429.